Palestinian political cartoonist Mohammad Sabaaneh has gained renown worldwide for his stark black-and-white drawings that express the numerous abuses and losses that his countrymen suffer under Israel's occupation and celebrate their popular resistance. 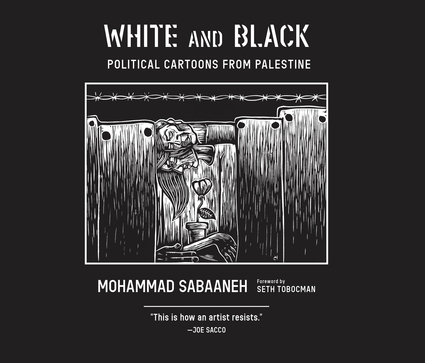 This collection includes 180 of Sabaaneh's best cartoons, including some depicting the privations he and other Palestinian political prisoners have suffered in Israel's many prisons. This book offers profound insights into the political and social struggles facing the Palestinian people and a pointed critique of the inaction or complicity of the "international community." Veteran graphic artist Seth Tobocman contributes a foreword. Mohammad Sabaaneh is the principal political cartoonist for the Palestinian Authority's daily newspaper, Al-Hayat al-Jadida, and a former political prisoner in Israel. A resident of Ramallah, Palestine, Sabaaneh's work has been exhibited in the United States and several European and Middle Eastern countries. He is the representative for the Cartoonists Rights Network International in the Middle East and the Ambassador of Palestine for United Sketches International. White and Black is his first book. Seth Tobocman is a comic book artist best known as co-founder and editor of the political comic book anthology World War 3 Illustrated.